I met Carol while in New York on my way to Katz’s Deli. 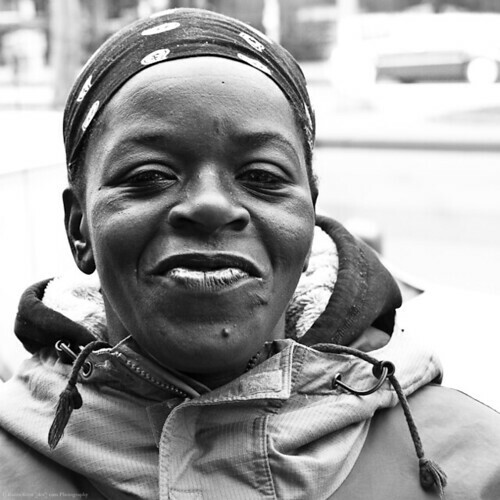 As I walked down E. Houston St. with my friends toward the deli, Carol was enthusiastically asking people for change. When I approached her and explained my project, she happily agreed. I asked my typical, “How long have you been in New York?” and Carol responded, “Been living in New York my entire life…born and raised.” She continued, “I’ve been dealt my cards and I’m just trying to get by here.” I told her, I was impressed with her positive, enthusiastic attitude. Unfortunately, I was in a rush to get to the deli and then off to the airport to catch my flight, so I had to cut the conversation short. As I said goodbye, Carol told me, “Put that picture up on a big poster or something and tell the world, I will survive!” I told her, “If I have the opportunity to do so, I will, but till then, make sure you take care” and continued on my way.